Every so often I receive a question from a reader about a tool they own. I enjoy this. It gives me a chance to virtually meet folks from across the country and across the world and discuss a topic we both love. The most recent question came from Vincent Tuinema, an architect in the Netherlands who found a nice vintage Stanley no. 18 block plane with an unusual feature – or lack thereof. Vincent’s no. 18 is a typical mid-20th century example in every way except one. There are no handi-grip indentions milled into the sides. He wanted to know the reason for this and age of the plane. Let the sleuthing begin! The first point to keep in mind about the no. 18 is that the body is identical in every way to the no. 9-1/2. Stanley no doubt used the same casting for both. Vincent’s excellent photos clearly show the raised Stanley marking at the toe of the plane, and Made in USA marked at the rear of the bed. This tells us that the plane was made after 1930, the approximate year in which the latter marking was permanently added. The second clue is found not by what I see, but what I don’t see. 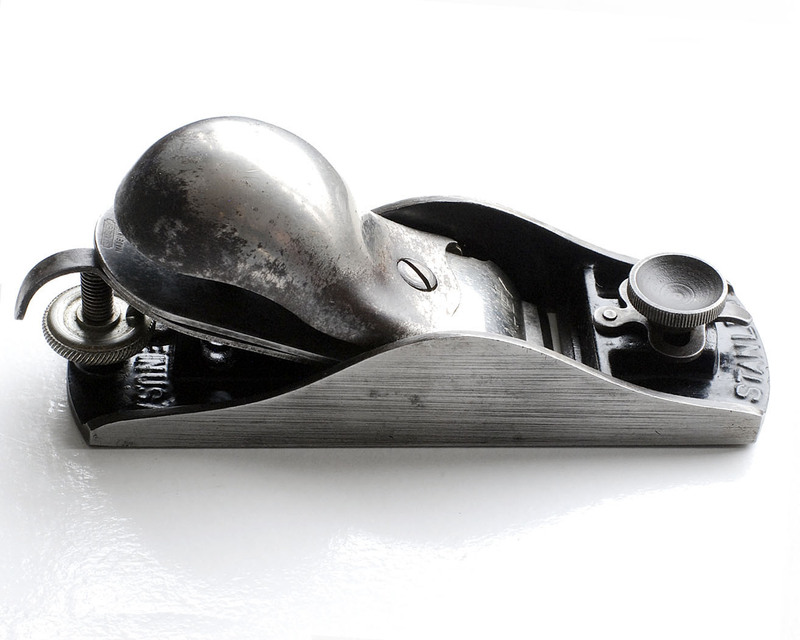 Block planes made after 1947 had the model number stamped into the bottom of one cheek (side). Since Vincent’s plane is not stamped this way, it indicates it was likely made before 1947. The third, and in this case, most telling clue is the lack of the milled handi-grip indentions. 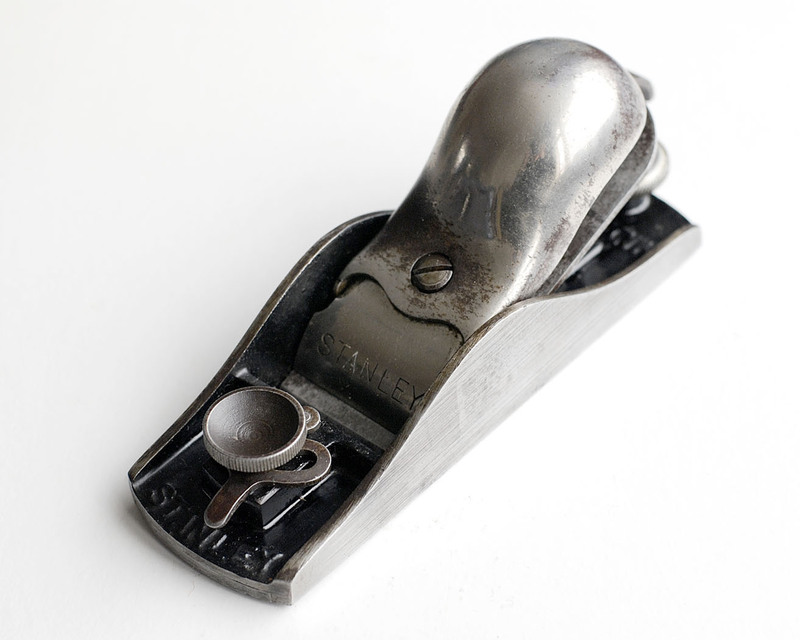 Although fairly uncommon, it is well documented that Stanley omitted the hand-grip feature on at least some of their block planes for a brief time during World War II. Patrick Leach’s Blood and Gore site indicates that this was likely due to the fact that Stanley was using the same machinery to mill similar indentions into Howitzer artillery shells to make them easier to grip. Similarly, brass was in short supply during the war, and Stanley switched to steel and rubber hardware on many of their planes. If you click on the photo at the bottom of the page, you can see that the front knob on this no. 18 appears to be made of steel, not the typical nickel plated brass. I suspect the rear adjustment wheel is probably steel as well. While the shortage of brass for commercial purposes during the war is understandable (they needed the brass for cartridges), it seems a little surprising that steel was so readily available. Considering of all the military hardware being produced, you would think steel would have been in short supply as well. This mystery solved, Vincent’s no. 18 is a nice example of a WWII vintage Stanley block plane. In the absence of a simple feature that we take for granted is reflected a time of sacrifice and uncertainty in our world. To me, it symbolizes the united efforts of a country and a world working in partnership to defeat tyranny. Sure, that sounds dramatic, but those missing handi-grip indentions were not just a mistake or cost cutting measure. They were omitted for a reason. They mean something. Thanks, Vincent, for sharing your photos and allowing me to use them for this post!